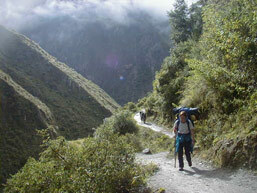 Peru’s best-known hike visited by thousands of tourists every year. The classical 43-km trek leading to the Sacred Inca City of Machupicchu combines the visit of mysterious archaeological sites, amazing mountain scenery and lush cloud forest rich in Andean flora and fauna. Machupicchu is reached at sunrise on the 4th day. Between 04.00-04.30am our private transport and staff will pick you up from your hotel. We drive to Piskacuchu (2700m/8856ft), a community located on the 82nd kilometer of the Cusco-Machupicchu railroad, which is the starting point of the Inca Trail. We begin our hike by crossing the bridge over the Urubamba River and walking along its left shore as it flows northwest along the Sacred Valley. Following the trail along a flat terrain, we arrive in Miskay (2800m/9184ft), to then ascend and finally see, from the tallest part of an overlook, the impressive Inca city of Llactapata (2650m/8692ft). We continue trekking along the valley created by the Kusichaca River, gradually climbing for about five hours until we reach the community of Wayllabamba (3000m/9840ft), where we set our first camp. All along the way we enjoy spectacular views of the Vilcanota ridge on the opposite side of the Urubamba River, where the impressive Veronica peak reigns at 5832 meters above sea level. Not to mention the diversity of wild flora and fauna that can be found all along the valley. We wake up at around 6:00 am and after breakfast; we begin the most difficult part of the trek, which consists of an abrupt and steep ascent that stretches for 9 km. Along this climb, the landscape changes from sierra to puna (a dry and high area with little vegetation). On the way to the first mountain pass, the Abra Warmihuañusca (Dead Woman’s Pass – 4200m/13776ft), we may see domesticated llamas and alpacas grazing on ichu, one of the few plants that grow at high altitude. We also cross an area of the so called cloud forest, which is the habitat for many different kinds of birds like hummingbirds and sparrows, and the Andean bear, which is also called the Spectacled Bear (Tremarctus Ornatus). We advise that on this day specially, your daypack is well stocked with candies, chocolates and coca leaves that will keep your sugar level high, and help with altitude sickness. Immediately after the pass, we descend into the Pacaymayo valley (3600m/11808ft), where we camp after approximately 7h of hiking. This day is the longest but also the most impressive and the most interesting, due the number of archaeological sites and the lush cloud forest area that we cross, so rich in Andean flora and fauna. From Pacaymayo we climb to the second pass, the Abra Runkurakay (3970m/13022ft). Halfway up, we stop to visit the archaeological complex with the same name. This site, located at 3800m/12464ft, consists of a small oval structure that is believed to have served the purpose of a watchtower. After going over the pass, we descend towards Yanacocha (Black Lagoon) and enter the cloud forest to finally arrive at Sayacmarca (3624m/11887ft). This is a beautiful complex made up of a semicircular construction, enclosures at different levels, narrow streets, liturgical fountains, patios and irrigation canals. Continuing up an easy climb, we arrive at the third pass, the Abra Phuyupatamarca (3700m/12136ft). Along this climb we can appreciate the magnitude of the Incas’ ancient craft, by walking along paths semi-detached from the mountain, and seeing rocks that fill up ravines in perfect order, saving the trail from the multileveled Andean geography. We go through an Inca tunnel to later arrive at the aforementioned pass and down to the complex of the same name. This is one of the most complete and best-preserved archaeological complexes along the Inca Trail to Machupicchu, and is located on the highest point of a mountain. Curiously, Phuyupatamarca means "town over the clouds". From above, one can observe a sophisticated sacred complex made up of water fountains with solid foundations, and also impressive views of the Urubamba River valley. We continue our trek down the long descending stone steps that lead us to Wiñaywayna (2650m/8692ft), an impressive Inca complex made up of an agricultural center with numerous terraces, a religious sector and an urban sector, close to which our camp is located. This campsite hosts a trekker lodge, a bar and bathrooms with hot shower facilities. After visiting the impressive archaeological site, we enjoy our farewell dinner at our camp. On this fourth and last day we get up at 4.00 am to leave Wiñaywayna an hour later and climb to the Intipunku, or The Sun Gate. This will take an hour of hiking along a trail of flat stones on the edges of cliffs in highland jungle. 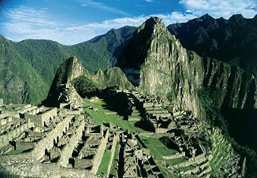 From this fabulous spot, we may see the sunrise over the sacred citadel of Machupicchu. From Intipunku we descend into Machupicchu, and 40 minutes later we enter the citadel from the highest point through the "House of the Guardians". We then descend to the control point where we register ourselves and leave our backpacks. 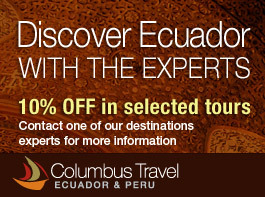 We immediately begin a complete guided tour of the Inca citadel that will take approximately two hours. You will then have free time to walk around, climb the Huaynapicchu Mountain, where one can experience spectacular views of all of Machupicchu, the valleys and mountains that surround it, or visit the Temple of the Moon or the fabulous Inca Bridge. 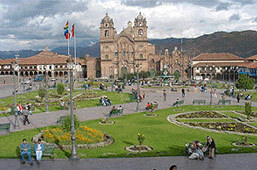 In the afternoon, we meet in the town of Aguas Calientes where, if you like, you can visit and relax in its hot springs. From here we take the train back to the city of Cusco, where we arrive after nightfall. Personal tents: 2 people in each 4-people-capacity tent, to allow for higher comfort and a safe keeping of backpacks. Our tents are 3-season.